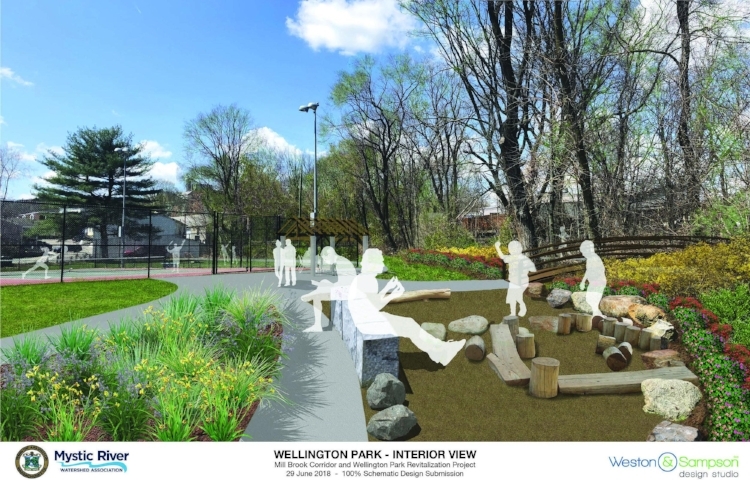 Arlington, MA- Mill Brook and Wellington Park are getting a makeover! From January to June 2018 the Mystic River Watershed Association led a robust participatory planning and design process to improve this underutilized park and hidden waterway. The recently completed design will be on display in a new exhibit titled “A Brook Runs Through It: Arlington’s Mill Brook Over Time” at Arlington’s historic Old Schwamb Mill. The exhibit will open Saturday, September 29, 2018 and will be on view through March 2019. Building on the plan, the Town has begun work to develop and implement ecologically sensitive flood management measures in the park thanks to a state Municipal Vulnerability Preparedness (MVP) grant awarded in June. 3:30–5:00 p.m. Opening Reception by the Old Schwamb Mill featuring a talk about the many ponds and mills that once sat alongside Mill Brook in Lexington and Arlington, and the brook’s presence in Arlington today. The exhibition will be open until March 9th, 2019. You can always see the designs online and read more about this project at: MysticRiver.org/millbrook. Below are renderings of the park from the final design. Credit: Weston & Sampson. About the Old Schwamb Mill: The Old Schwamb Mill is historic 19th-century mill, still in operation, at 17 Mill Lane in Arlington. The current mill building, erected in 1861, is a living history museum. The property was listed on the National Register of Historic Places in 1971. About the Mystic River Watershed Association: The Mystic River Watershed Association (MyRWA) works to improve the lives of the more than half million residents of Mystic River communities through its efforts to protect and restore water quality, natural habitat and open space throughout the 76 square mile watershed. For more information see MysticRiver.org. About Mystic Greenways: Mystic Greenways Initiative will connect 20 miles of paths, improve hundreds of acres of parkland and engage thousands of community members from the Mystic Lakes to the Boston Harbor. For more information see www.MysticRiver.org/greenways.